What is a monolithic cement slab? The term monolithic is used in concrete construction to define pouring different concrete elements simultaneously. For example, the interior footing shown on detail 2 below is intended to be poured simultaneously with the floor slab. 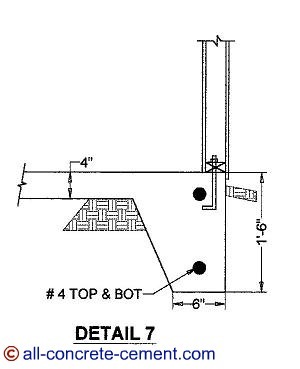 You can tell this by the fact there is no vertical lines at the ends of the 1'-8" mark that signify cold joint if poured in separate pours from the slab. Another name for detail 2 is thicken slab where the top remain level with the rest of the slab but the bottom is thickened to support bearing walls. If you notice, there is no anchor bolts shown in the detail. This is an indication that the wall on top of this slab is bearing wall not shear wall. Constructing monolithic cement slab is very advantageous because it saves a lot of time in labor for doing formwork. If you have several hundred or several thousand feet of these interior footings, this can mean weeks in savings and several thousands dollars on material and labor on top of concrete pumping as savings. 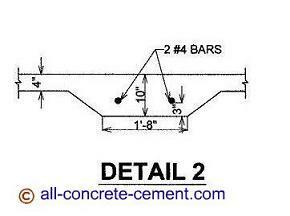 Detail 7 is another example of monolithic slab and is also called turn down slab. This is very common in constructing sheds and garages though more and more homes are using this method nowadays. The thickened edge is usually at the perimeter of the structure aligned directly below bearing walls and non-bearing walls. The thickened edge is also needed at the non-bearing wall side for shear because all four sides of walls in a shed or garage are shear walls. These shear walls are critical in stiffening the structure to withstand wind loads which is the governing load for isolated structures.